Inspired by the new wave of zero waste and low packaging initiatives springing up around the country (and the many requests we’ve been getting from you!) we’re planning to trial a small number of ‘unpacked’ products at Unicorn. 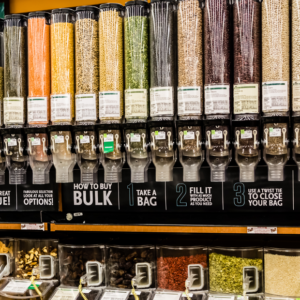 During February and March, we’ll have some of Hodmedods’ UK grains and pulses available in bulk dispensers for you to fill up your own containers, using a simple (we hope) weigh-it-yourself system. You just bring a clean, dry container (bag, jar, box, whatever!) and at the dispensers – located at the end of the biscuit aisle – there’s a scale to weigh your container (this gives you a barcode to stick on). Then fill your container, scan and weigh again, and you’re done. We’ll also provide paper bags while folk are getting used to bringing their own, but the idea long-term is definitely to reduce single-use packaging use of any kind (bearing in mind that paper has a high carbon footprint, maybe even higher than plastic). The trial will help us to work out whether this is something we might be able to roll out more widely/permanently, whether busy shoppers will want to use it and what the implications are for labour, cost, space, time and congestion! We’re really keen to minimise the amount of packaging we generate (read more on that here), and this is an obvious route we need to explore, but the shop and car park, as many of you will have experienced, are both stretched to bursting at certain times in the week, and we’ve got zero space to expand into now that the leisure centre site is almost definitely earmarked for other uses. Filling your own containers inevitably takes a bit longer and a bit more space than grabbing a bag off the shelf, so we need to figure out how this sort of system might affect folks’ movement around the shop – we want shopping here to continue to be an enjoyable, peaceful experience for you and us! So, no promises, but we are excited to see how it goes. A wholescale transition to ‘unpacking’ the two hundred or so own-brand lines we currently pack down would be quite an undertaking, involving a pretty major physical restructuring of the shop, big changes for our staffing (we create hundreds of hours employment each week in the packing room) and indeed our whole commercial model (these products account for almost a quarter of our sales). So it’s not something we’re looking at for the near future, but the trial should help us work out how this sort of system might fit into our offer, perhaps in a gradual way. We hope you enjoy it!